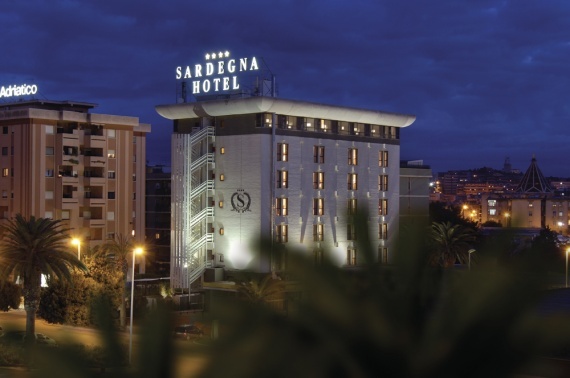 Sardegna Hotel, elegant and refined 4 star hotel has been completely renovated, it has 84 rooms including 6 suites with jacuzzi. Its restaurant serves high-quality cuisine inspired by seasonal flavors and fragrances. Sardegna Hotel has 84 rooms, including 6 suites, all completely renovated and equiped with luxurious high-tech simplicity mixed with a warm atmosphere. The richness of the woods, the soothing colors and the pleasure of all the contemporary comforts accentuate the intimacy of the staff, offering to each guest a feeling privileged home".New rooms all to live, full of design and technology, the most stylish comfort and relaxation more private, to feel perfectly at ease. In our elegant restaurant the flavors of the sea and the fruits of the earth are mixed to taste Sardinian cuisine dishes and classic international cuisine. The authenticity and freshness of the ingredients are combined the creativity of the chef, offering a high quality cuisine inspired by the flavors and scents of the seasons.